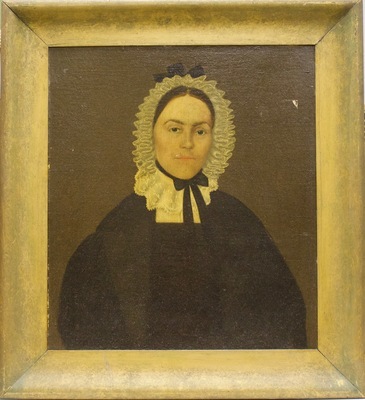 Mrs. Fuller Eaton was an instructor at Middlebury College Vermont, August 14, 1831 and was the mother of Harriet Eaton Ross. Painted in Enosburgh, Vermont, by a self-taught itinerant painter, the enchanting work compares stylistically with other stiffly posed and awkwardly drawn portraits by early American limners. Interestingly, the decorative painting was executed the year of the Daguerreotype’s invention, which introduced photography as a means to capture likenesses and soon competed with the portrait painter’s trade. The portrait was restored and framed by Professor Paul E. Barr, whose painting is also included in the exhibition. Barr was the first chair of UND’s Department of Art.